A big warm welcome to my new followers! Thank you for joining my blog!! I have finished my first reports last week and so happy that they are done!! I may have a few little things to fix/edit tomorrow but that's it! Now it's the homestretch to the holidays! I would like to send out big hugs and a BIG THANK YOU to all of you who commented on my completion of Jane Philpott. I truly appreciate all of your comments and still have many to reply to!! I hope to get at them today after this post. I also want to visit blogs too but just opened up the reader and....GASP it's at 1000 + posts!! I hope to conquer some of those posts today!! Here's my uber late TUSAL pic. As for IHSW, well, that was report weekend, so I didn't stitch a lot. I did promise Joyce a Chatelaine SAL and I managed to get just a few stitches in. Very abysmal progress. Dear Joyce stitched a whole butterfly! Way to go girlie!! I also stitched a bit on Tea Bath Fairy. The filling in of the tea cup is taking awhile!! This weekend, I stitched up two ornies and will be finishing them hopefully next weekend. I loved stitching both designs, especially the Partridge one. I will try to finish it as a triangle ornament. Hopefully that will work out. As for Christmas cards, I have a couple of people I will be sending out cards to in the next little while. If anyone else wants to exchange Christmas cards with me let me know! I love getting cards in the mail other than bills!!! Just email me and send me your address!! Also, I have some pieces of Aida that I will never use. If anyone would like them, leave a comment saying so and I will do a mini draw and mail it out before Christmas. I'll give it a week, or until I do my next post. Here's the cream and red aida cloth with Titus. And no, he isn't being given away!! Titus giving you all a fond farewell!! very lovely stitching..great wip's..i love them so much..
That Chatelaine piece is so pretty! The Tea Bath Fairy is looking very interesting these days too. Love your ornies as well. I love anything Prairie Schooler. lol! Always love seeing Titus, of course. Mia says hi! Titus is wonderful, as always :) Love the ornies and love your Chat progress. I'm so greedy for more! tee hee! You got some great pictures of Titus. You got quite a bit accomplished considering you are sooo busy. Those big WIP's can seem to go so slow. But a lot of good progress there. Nice to alternate with little ornaments too so you get that sense of accomplishment! Looks like Titus may want to enter the giveaway! I love the last photo of Titus. Count me in for the Aida - I could totally use the red for mysterious projects! Love your progress and your finishes. Those will make great ornaments. I would like to enter your aida draw. That's what I use most of the time, so I always like to have some around. I would love to exchange Christmas cards with you! I'll send you an email with my address. Great stitches ~ and Titus, as always, is a cutie!! Titus always makes me smile. Chatelaine designs are amazing - they have so much detail in them. Awww look at Titus - so sleepy! I would to do a card exchange if you are still looking for people, if so please email me. I was so disappointed Titus would not be included in the drawing! Giggle, I think you made great progress for IHSW, you finished two ornies! I love your chatelaine progress, so delicate. Congratulations getting some assignments done!!! Great job on the ornaments. Such cute ornaments! Now for the finishing-that's where I tend to procrastinate! Lovely stitching and orts. Well done on getting your assignments done. Very nice ornaments, and great WIPs - well done! Hugs to you and Titus!! More excellent progress Anne! Gotta love the huge ol' yawn Titus is giving us hehe! Definitely count me in for the red Aida, I was just thinking I should get some red fabric! LOL...looks like I am way more excited over this update than Titus is! =D Congrats on getting your reports done, and congrats on the beautiful ornaments! All the WIPs look great. great progress you did on your stitches!! i'm a little behind on mine because free time is not been very, but i hope to do it before christmas! Nice progress on your WIPs! I love your ornaments. The PS is much prettier than the chart pic suggests, I'm definitely going to have to stitch it! I'm a sucker for PS ornaments. Oooo, I love your blue glass pieces! They're wonderful! And congrats on your small finish and the progress on Tea Cup Fairy! I think you're speedy! I am so behind! You've been busy, everything looks great! Is Titus tired of you stitching and waiting for you to play with him?! 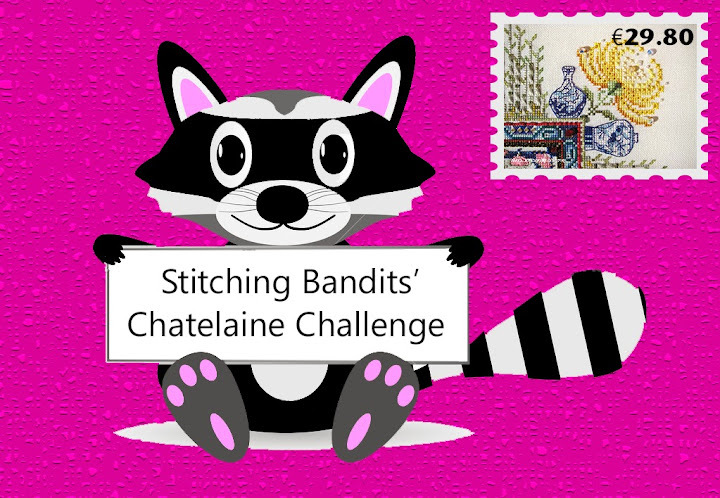 Your Chatelaine stitching looks gorgeous! And I love the ornaments! So pretty! Wonderful stitching and Titus looks like he does not like his rest time interrupted! I would love to exchange cards...email on the way. Well done on your stitching progress. They all look fab! !